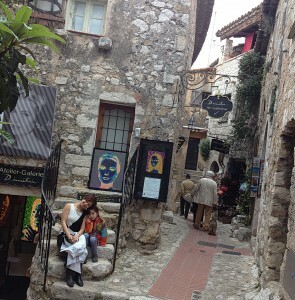 Walt Disney and I have one thing in common: we both love Eze in France. I fell in love with it at first glance, the moment I held my chin high to spot the medieval town that’s perched on a hilltop. 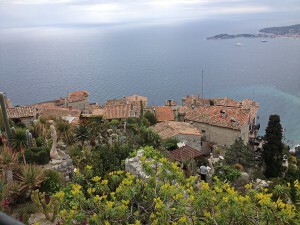 Eze, also called Eagle’s nest because of its location, has a magnificent view of the sea. As I stood in the garden, Jardin d’ Eze, I imagined ancient times when Phoenicians crossed the Mediterranean Sea, found Eze, and built a temple for Isis. There is an ankh, an Egyptian cross, in the church as a proof of the Phoenician visit. 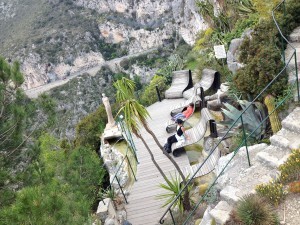 While I romanticized about Eze, my six-year old loved zigzagging through the garden filled with cacti and succulents. Hubby took pictures by the thousands. 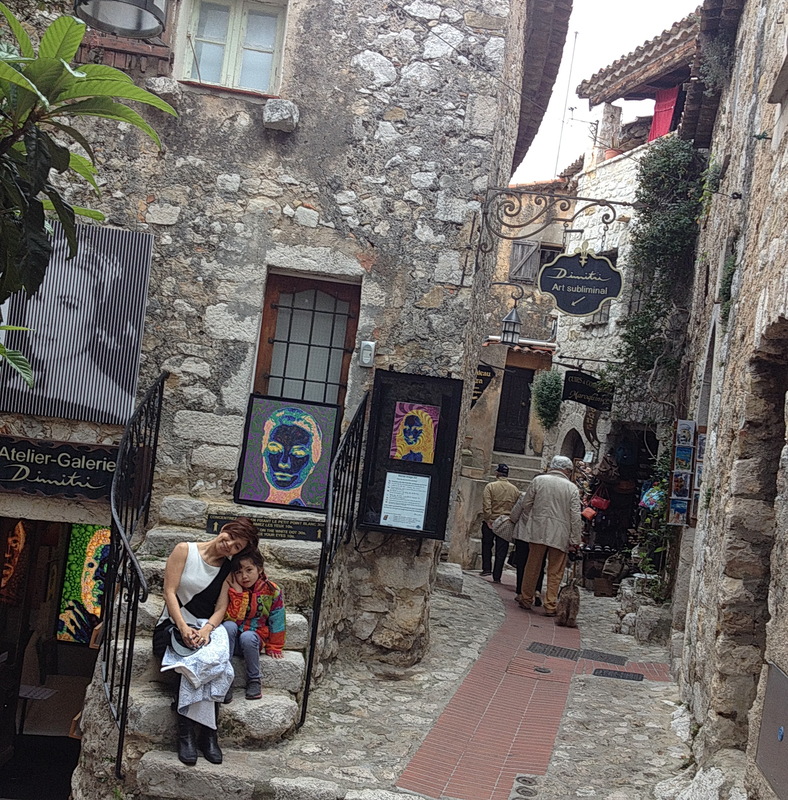 There are many boutiques with handmade products and art. 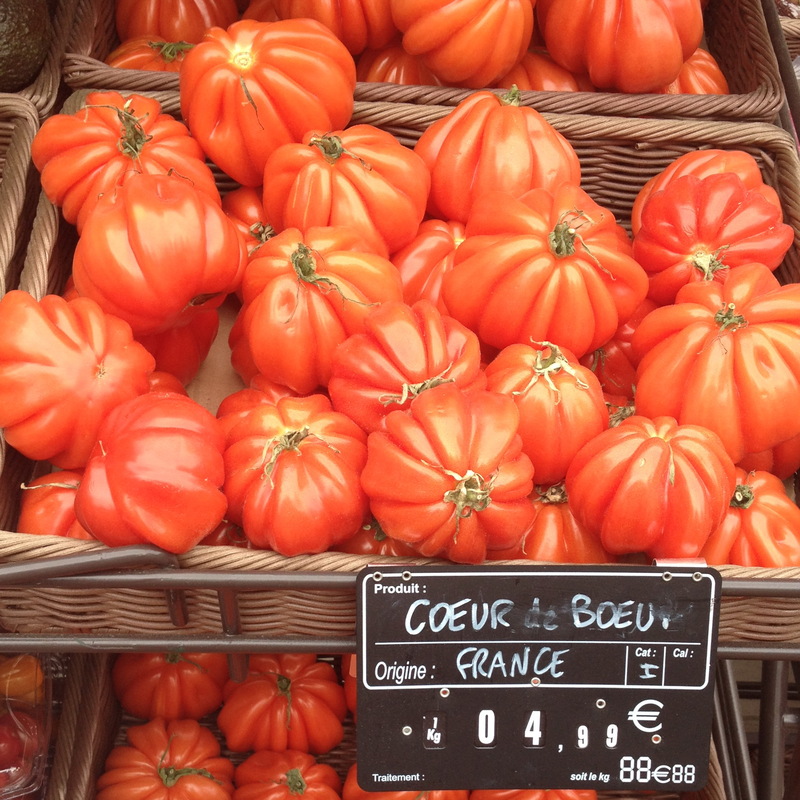 So we visited some, found our favorites, and bought some items. 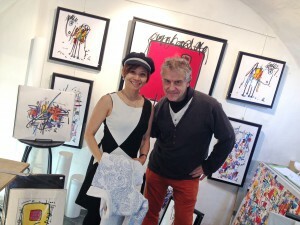 The painters we met, Barbara Blanche and Luc Villard, were very accommodating. And we liked their paintings, especially Luc’s abstracts. Somehow I regret that I did not buy a wide-brimmed Italian hat, but you see, my rule is that I only buy stuffs made from the country that I visit. Then came the need to visit the restroom. We needed coins, but we didn’t have any. The gentleman ahead of me in the short queue offered a coin, and I accepted it. But then when he came out of the toilet and it was my turn, I felt that I could get in the toilet anyway and left his coin back to him. That was mistake. I should’ve kept his coin. Because when I got in the toilet, the light turned off, a spray went off (to clean the cubicle) and to my great shock, the wall behind me opened to swallow in the toilet bowl and out came another! And everything happened in a fog, because the water spraying still went on! I screamed, I was wet on the lower part of my black-and- white dress and rushed out, only to see that people around the toilet stared alertly at me, probably wondering what went on. -Make sure to use coins! was all that I said. Please check once again your spelling; EZE and no accent on the last “e”. Yes, I saw I wrote I was writing Eze in two different ways, one correct, and the other wrong. I appreciate that you take time to corrext, Lis!